It's time I started blogging some Explore/Design Space tips.... here's my first one! 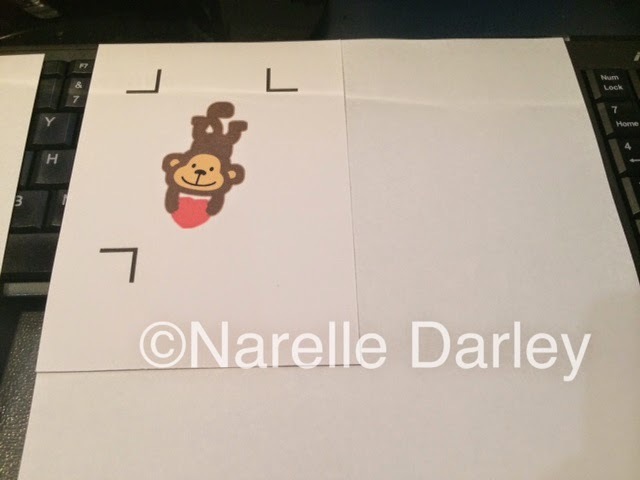 Saving paper when printing small images with Print then Cut. There's a couple of ways you can do this depending on how big your image is. For something that only uses approx 1/4 of a sheet of 8.5 x 11 I cut my cardstock in 1/4's and use temporary adhesive (I used a Scrapbook Adhesives E-Z Dots repositionable tape runner) to adhere one piece to the corner of a sheet of plain copy paper. I insert that into the printer tray (you'll need to work out which way it needs to go in - face up/face down etc) and send that to the printer in the usual way from Design Space. If printed perfectly! And the registration marks were in exactly the correct position and the correct size for the Explore to find them. For bigger images, you can use half a sheet and print it the same way. Or on my printer I was able to load the half sheet into the rear paper feed slot. I was also able to just place it in the regular paper tray without adhering it to copy paper, but that can jam the printer. (It did for me once out of about 5 attempts. Thank you Narelle! I just started practicing with Print Then Cut today and my first thought was "Good grief, I'm wasting so much white cardstock. My scrap stash will be huge." I'll definitely try this. Off to the store now for more color ink!